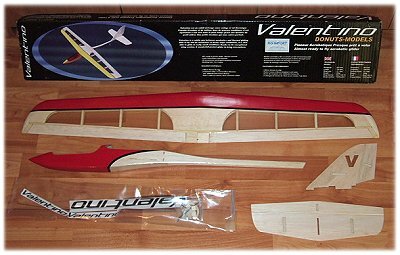 The Valentino is manufactured by French company Donuts Models and it's a 3 channel aerobatic sport rc glider sold in ARTF form (discontinued since the writing of this page). 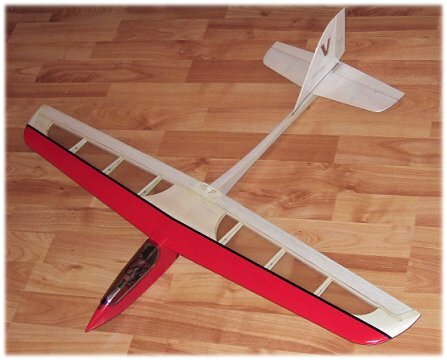 I'm a big rc glider fan and found the Valentino while searching for something to replace my retired Eraser EPP combat glider. The Valentino most definitely cannot stand up to the levels of abuse that the Eraser suffered, but in terms of size and performance it certainly matches the Eraser. At just under 1 meter wingspan, the Valentino is just the right size glider I was looking for. Valentino - what's in the box? The Donuts Models Valentino comes Almost Ready To Fly and the quality of workmanship is excellent. 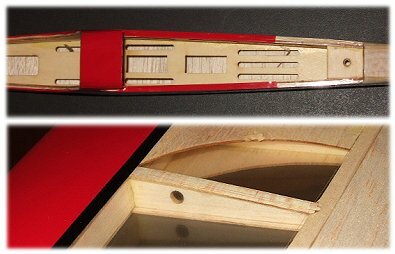 Construction is of balsa and ply with CNC or laser cut parts. Accuracy is spot on and the quality of covering - although transparent would never be my first choice - is excellent. Incidentally, the glider is available in red or yellow versions, both options being of the same covering pattern. All hardware is included and the tinted canopy is an excellent fit over the cockpit. As you'd expect with a quality ARTF kit, all the right holes are cut in all the right places. The only modifying I had to do was to open up the servo holes slightly because I used 9g servos as opposed to the recommended 6g ones that are marginally smaller in physical size. including lightened and capped wing ribs. Radio (Spektrum AR6200 receiver and Hi-Tech HS-55 servos) installation was straightforward enough apart from the aforementioned modification. Location of the dual receivers of the AR6200 took a bit of thinking about, but I managed to get them separated adequately enough - the main unit in the nose and the remote one tucked in behind the elevator and rudder servos. Incidentally, I chose the AR6000 because I had a spare one kicking around, but this has since been replaced with an AR6100e. The 4 cell (AAA) 1000mAh battery pack fitted into the battery slot a treat, held tightly in place with foam. Above: the cockpit is crowded but everything is in there! From left to right, the battery pack, switch harness and Rx. Above: rudder and elevator servo and the remote Rx behind, packed in foam. 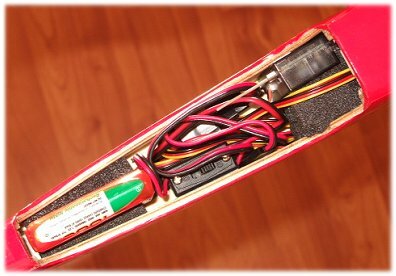 One servo is used on each aileron which means that a flaperon or spoileron set-up can be mixed in if your transmitter has this capability. 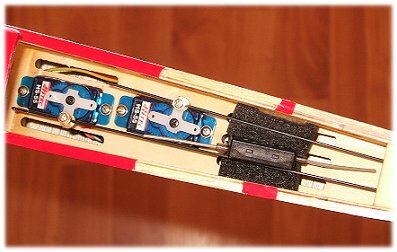 One word with the aileron servo installation though... Because my choice of servo was larger than the recommended one, the HS-55's didn't fit completely into the compartments, resulting in the compartment covers having a slight curvature due to the extra width of the servo. No biggie really. 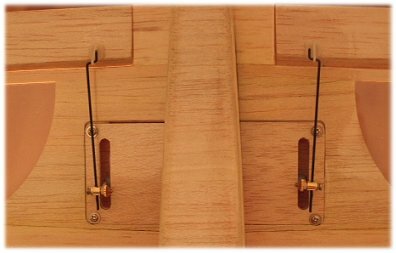 Above: a servo for each aileron and neatly cut compartments for each. A few hours saw my Donuts Models Valentino ready for action. I didn't get to fly it straight away though, due to windless days, but the eventual maiden flight was about as smooth as it could be. The glider handles very well and is very responsive with the digital 2.4GHz rc set up. Aerobatics are easy, the ailerons really giving the Valentino all the maneuverability it needs. Good job Donuts Models! The glider shown above is actually a replacement to the original, which arrived crushed! Careless handling by a careless courier meant that a heavy parcel got thrown onto the box somewhere en route through Spain. Thanks, SEUR. The fus and wing were both damaged beyond reasonable repair and so a new glider was ordered by the vendor. Unfortunately for me, a new glider wasn't immediately available for whatever reason so it meant over a month's waiting for the new one to arrive! Since writing this page, I've had many many more flights with the Valentino in a wider variety of conditions, even in winds up to around 25mph. Penetration in to the wind really is excellent, and my Valentino continues to get regular flights on my local slopes.